The price of any product or service is normally determined by two variables, supply and demand. 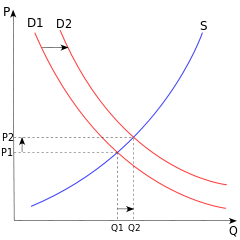 In economics, prices rise as demand increases, as supply decreases, or a combination of the two. It’s only when supply keeps pace with demand that the price of gasoline stabilizes or declines. Since we know that the world’s population is increasing, not decreasing, more gasoline production is constantly required, not less. It doesn’t take a rocket scientist to figure that out. Thus, the only way to reduce gasoline prices, in the face of rising global demand, is through greater production. Yet, U.S. oil production has been on the rise since 2009, while demand has declined. So, why is gasoline stuck above $3.25 a gallon? Was there suddenly a great demand for solar panels, biofuels, windmills and electric cars in 2009? The answer is no. 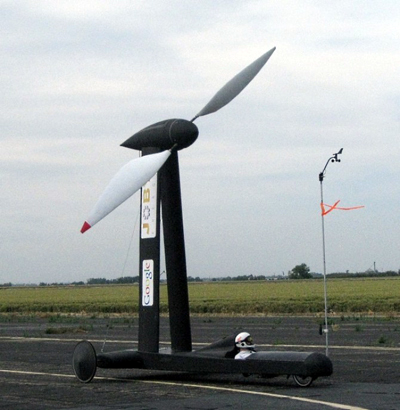 Do cars and trucks run on solar panels and wind turbines? The answer is no. Yet, the 2009 stimulus set aside $80 billion in deficit financing to subsidize politically preferred green energy projects, which had little or no demand at the time. 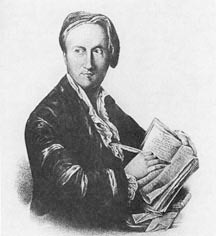 In fact, there is little demand for such products today. What the world demanded in 2009 is the same thing it demands today, more gasoline. So why is the federal government involved in providing things that are not actually demanded by anyone? 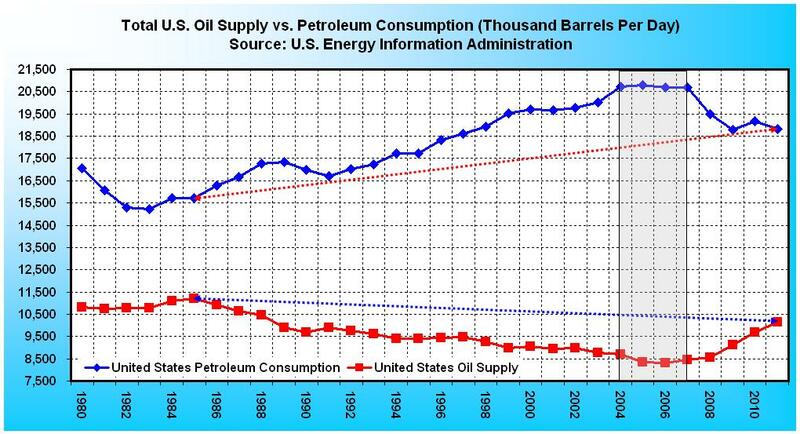 According to the Energy Information Administration, global oil consumption declined slightly in 2008, 2009 and 2010, while global supply has kept pace with demand (see chart above). 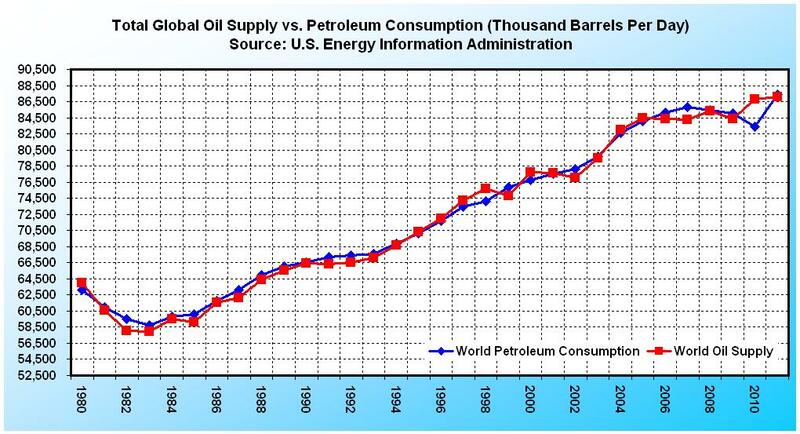 In 2010, global supply actually exceeded demand, but as of 2011, the latest statistics available, world demand set a new record of 87,421,000 barrels per day, up from 83,412,000 in 2010. Yet global supply has kept pace with demand. So why have U.S. gasoline prices climbed by more than 90% since January 2009? The answer doesn’t involve oil supply and demand, it has to do with the decline of the U.S. dollar. 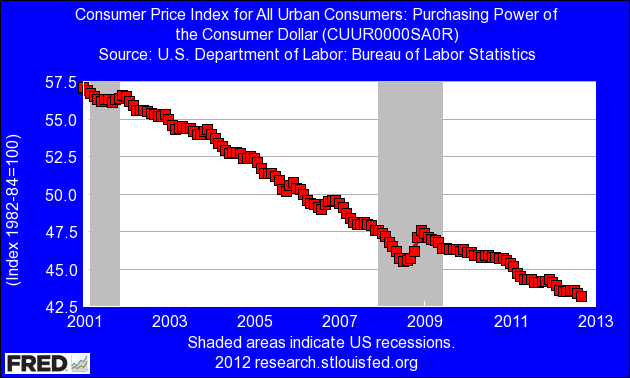 The purchasing power of the consumer dollar has declined by 24.3% since 2001 (see chart below). The dollar actually strengthened for a brief 5-month period, from September 2008 to January 2009, but then resumed its decline, having fallen by 8.9% since January 2011. What happened to the price of gasoline during the five-month’s that the dollar strengthened? It declined dramatically, from $3.72 a gallon to $1.64 (see Part I). 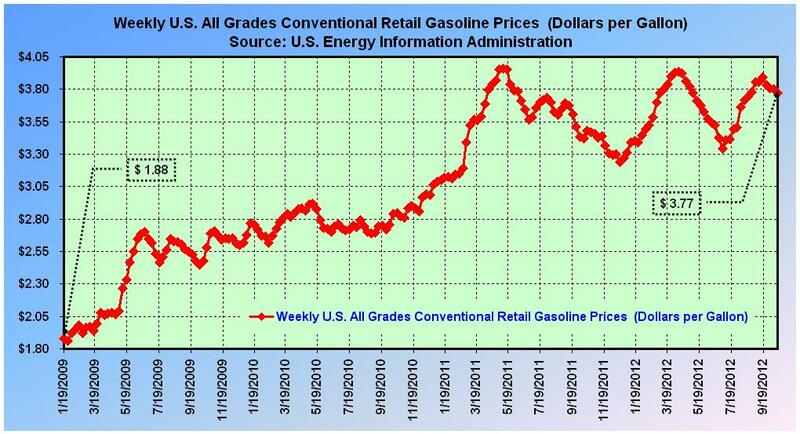 And what happened to the price of gasoline after January 2011? It shot past the $3.25 per gallon breaking point, where it remains today. What caused the dollar to decline? The U.S. monetary base, the total amount of a currency that is either circulated in the hands of the public or in the commercial bank deposits held in the central bank’s reserves, has increased by 324.2% since 2001. The money base grew from $616.7 billion in 2001, to $2.6 trillion as of September 2012. 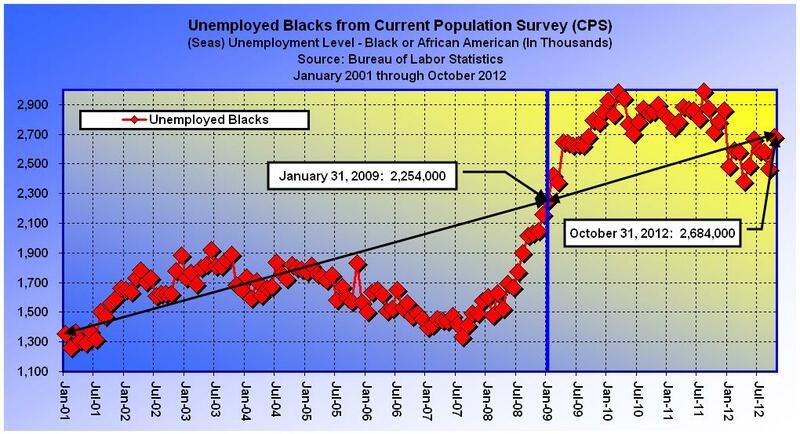 You can see in the chart below, that $256 billion of this increase occurred between January 2001 and September 2008. 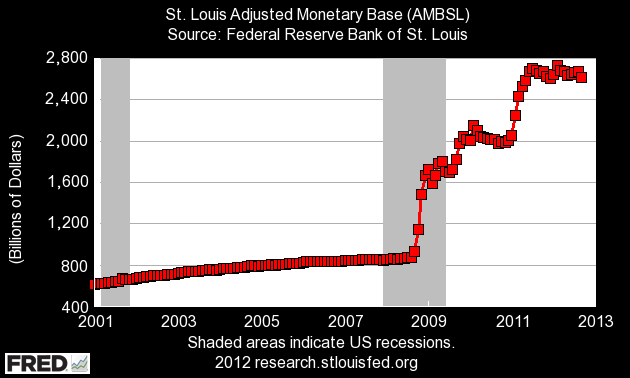 But from September 2008 to January 2009 the monetary base increased by $858 billion. However, this initial increase actually strengthened the dollar, and was, evidentially, the precise temporary stimulus needed at the time. The only problem with this brilliant strategy was that it wasn’t temporary. Instead of winding down at the end of January 2009, what had been a well timed temporary stimulus was unfortunately doubled. Since then, the monetary base has been jacked up by another $886 billion. Instead of a temporary stimulus, what we wound up with was a permanent doubling-down of the original amount. Is this what the economy needed? What was the result? This time instead of strengthening, the purchasing power of the dollar plummeted. 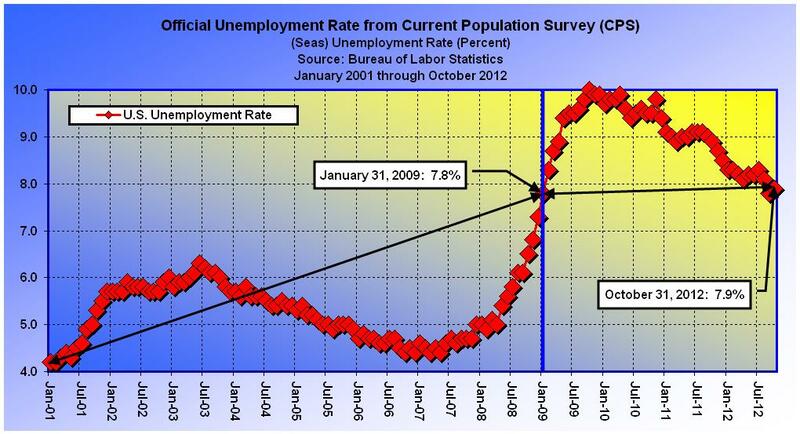 Thus, by the time Barack Obama was inaugurated, the economy had already received the temporary stimulus it required. How do we know? The proof is the decline in the price of gasoline, to near its historic inflation adjusted norm of $1.73 a gallon (see Part I). But ever since then, the price of gas has risen from $1.88 to $3.65. That’s the proof. What we have witnessed during the Obama Administration has been reckless and unnecessary deficit-financed spending, which not only added six-months to the Great Recession, but has lead to a prolonged period of stagnation. The Federal Reserve should have started reducing the monetary base in February 2009, but was unable to, due to the Barack Obama’s unprecedented $832 billion stimulus plan. In addition, as a result of Mr. Obama’s $1 trillion-plus annual budget deficits for the past four consecutive years, instead of being able to control the money base, the Fed has been forced into the unlimited printing of dollars, vis-à-vis QE3. Based on the current trajectory, what we can expect with another four years of Barack Obama is a continued decline in the purchasing power of the dollar, and higher gasoline prices, in spite of improved U.S. supply and falling demand. The problem with high gasoline prices is they lead to recessions, while lower prices foster economic expansion. The target price for gasoline is the 1992 inflation adjusted price, $1.86 a gallon. The current price is $3.65. In the midst of the Great Recession, the average price of gasoline only exceeded the breaking point ($3.25 a gallon) for a total of 31 weeks. In contrast, the current price has remained above the breaking point for a total of 86 consecutive weeks, from February 28, 2011 to present. What does that tell you? It leads me to believe that the U.S. is currently in recession. 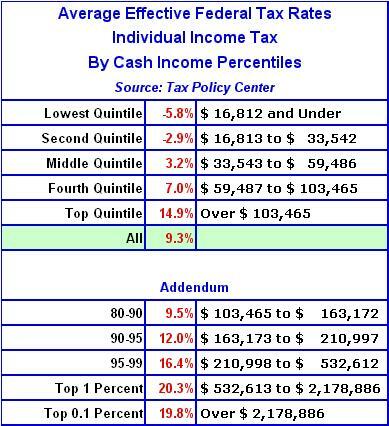 The cause: Inflation due to excessive money printing, necessitated as the result of an $832 billion stimulus, and unprecedented trillion dollar budget deficits due to Barack Obama’s inability to govern. Is there a witness? 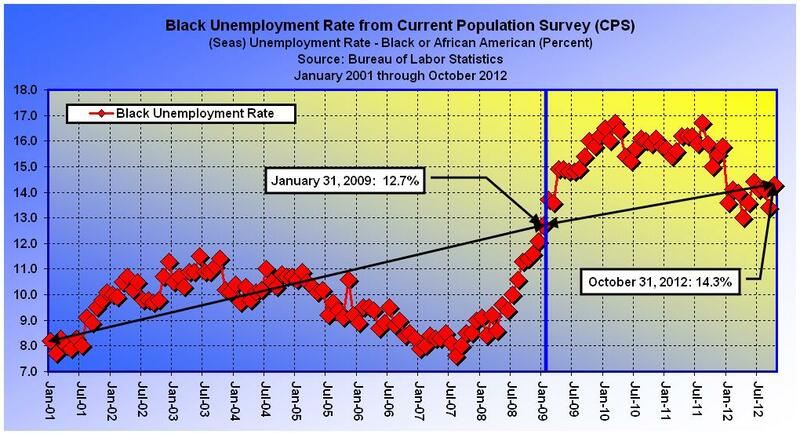 The policies of Barack Obama didn’t deliver us from the Great Recession, they prolonged it. The $832 billion stimulus plan merely created an artificial demand for U.S. dollars, and is directly responsible for re-inflating the same imbalances that existed prior to the recession. How can we tell whether or not we’re better off than we were four years ago? Well, here’s what’s different today. We are more than $16 trillion in debt, 25 million Americans are either unemployed or underemployed, instead of reducing the money base the Federal Reserve is printing more money to purchase mortgage-backed debt on an unlimited basis, our tax and regulatory structure is mired in uncertainty, we are suffering from a foreign policy meltdown, and the price of gasoline has remained over $3.25 for a record 86 consecutive weeks. The Obama Administration has done everything in its power to hide the truth from us, but we’re just not going to take it anymore. Americans can take a lot, but one thing we won’t tolerate is government officials who try to deceive us. The federal government can easily manipulate unemployment statistics, since the numbers are basically made-up anyway, but it cannot so easily engineer the price of gasoline. To do so would entail releasing oil from the Strategic Petroleum Reserve, which is in place to mitigate national emergencies, not sway elections. Four years of Barack Obama’s policies solved nothing. We are currently teetering somewhere between back where we started from, to worse off than we have ever been. 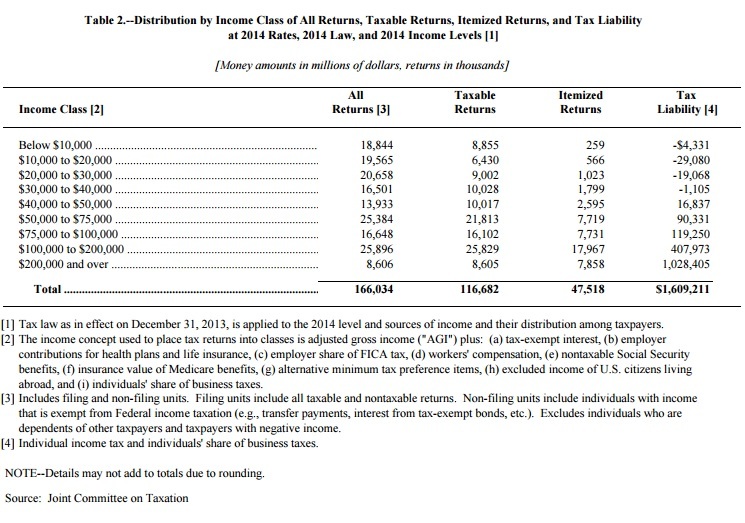 And with a looming fiscal cliff, another four years of Obama will only make things worse. America can’t take another four years of trifling rhetoric, high gasoline prices, or another government-prolonged recession. It’s time to wash our hands of the Obama Administration, and time to turn toward mature, experienced, and responsible leadership. You know what time it is! Forget Fact Checking: Where’s the Logic? In a real town hall meeting, the person asking a question gets to follow up. What we saw Tuesday night wasn’t a town hall meeting at all. The readers appeared to be simply mouthing someone else’s prearranged questions. There wasn’t any passion. But what if the public was allowed to retort? Following are my thoughts on the lecture Barack Obama provided in response to the second question, a rather simple one which he has yet to answer. QUESTION: Your energy secretary, Steven Chu, has now been on record three times stating it’s not policy of his department to help lower gas prices. Do you agree with Secretary Chu that this is not the job of the Energy Department? OBAMA: The most important thing we can do is to make sure we control our own energy. So here’s what I’ve done since I’ve been president. We have increased oil production to the highest levels in 16 years. Natural gas production is the highest it’s been in decades. We have seen increases in coal production and coal employment. 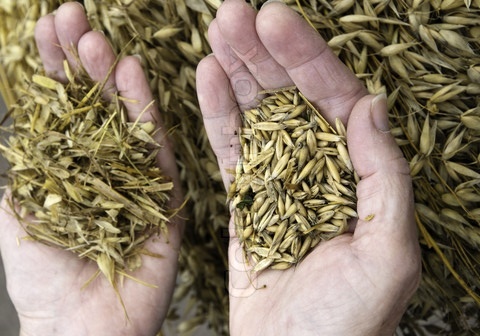 But what I’ve also said is we can’t just produce traditional source of energy. We’ve also got to look to the future. That’s why we doubled fuel efficiency standards on cars. That means that in the middle of the next decade, any car you buy, you’re going to end up going twice as far on a gallon of gas. That’s why we doubled clean — clean energy production like wind and solar and biofuels. So by the middle of the next decade, or around the year 2025, if I’m in the new car buying market at the time, I’ll be able to go twice as far on a gallon of gas. But, since a gallon of gas today costs more than twice what it did four years ago, we’re already at net zero. Mr. President, I was talking about today, right now, not 13 years from now or sometime after I’m dead and gone. And what exactly do coal, wind and solar have to do with the price of gasoline? 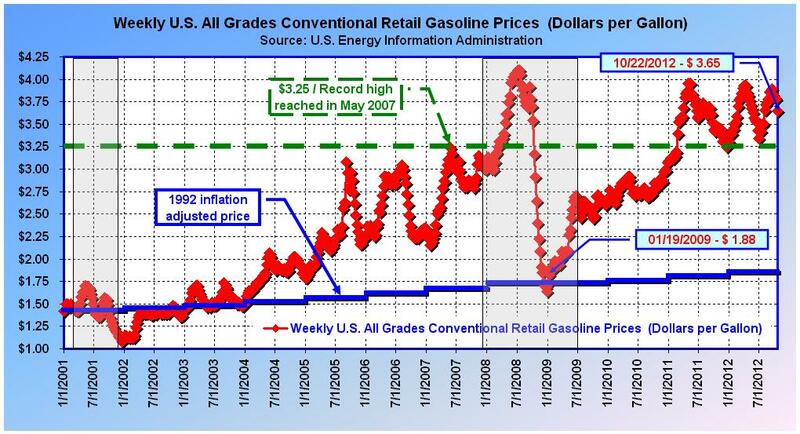 Retail gasoline prices are sitting at a national average of $3.77 a gallon, just $0.33 off the all time high of $4.10 set in July 2008 (see chart above). And all these things have contributed to us lowering our oil imports to the lowest levels in 16 years. Now, I want to build on that. And that means, yes, we still continue to open up new areas for drilling. We continue to make it a priority for us to go after natural gas. We’ve got potentially 600,000 jobs and 100 years worth of energy right beneath our feet with natural gas. Oil imports may be at the lowest levels in 16 years, but the gasoline I need to fill up my tank only cost an average of $1.23 a gallon in 1996, which would be equivalent to around $1.81 today, yet I’m paying around $4.00. Is the reason gasoline cost so much today perhaps the result of fewer imports? And as far as natural gas goes, can I fill up my tank with that tomorrow morning? And we can do it in an environmentally sound way. But we’ve also got to continue to figure out how we have efficiency energy, because ultimately that’s how we’re going to reduce demand and that’s what’s going to keep gas prices lower. We can drill for oil in an environmentally sound way? What does that mean? And what do you mean by ultimately reducing demand? How far away is that, longer than four years? Although it’s true that less demand can result in lower prices, it only works if supply remains constant or increases. But if both supply and demand are cut at the same time, then consumers won’t realize any price change at all. And if demand declines too rapidly, then many suppliers may be forced out of business. And then what will we do? Now, Governor Romney will say he’s got an all-of-the-above plan, but basically his plan is to let the oil companies write the energy policies. So he’s got the oil and gas part, but he doesn’t have the clean energy part. And if we are only thinking about tomorrow or the next day and not thinking about 10 years from now, we’re not going to control our own economic future. Because China, Germany, they’re making these investments. And I’m not going to cede those jobs of the future to those countries. I expect those new energy sources to be built right here in the United States. 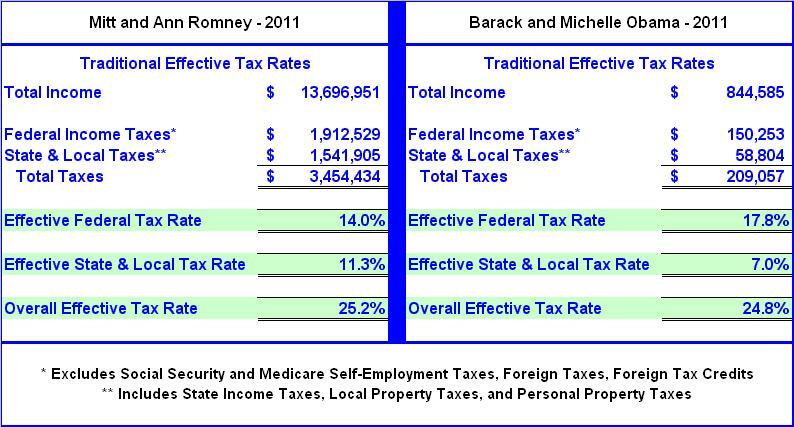 Mr. President, I don’t need you to tell me what Governor Romney’s plan is, he can do that himself. The question was: Do you agree with Secretary Chu that it’s not the job of the Energy Department to help lower gas prices? So it seems your answer is that I need to be thinking about 10 years from now, and forget about how I’m going to get to and from work today, tomorrow, next week, or even four years from now. I see. And you’re willing to cede the jobs of the present in hopes that jobs of the future will be based on your present day policies, which for all we know might be considered archaic a month from now. That’s going to help Jeremy get a job. It’s also going to make sure that you’re not paying as much for gas. What’s going to help Jeremy get a job, a policy geared to kick in by the middle of the next decade? In the meantime I guess poor Jeremy will have to get by on two or three McJobs, and hope he makes enough to cover the cost of getting to and from work. So is that it? Are you finished? OBAMA: Candy, there’s no doubt that world demand’s gone up, but our production is going up, and we’re using oil more efficiently. 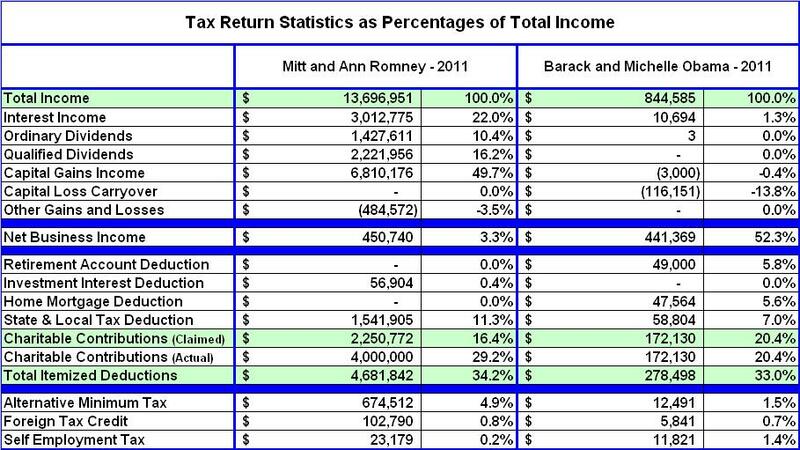 And very little of what Governor Romney just said is true. We’ve opened up public lands. We’re actually drilling more on public lands than in the previous administration and my — the previous president was an oil man. Wait, so world oil demand and our production are going up? But you just said that our ultimate goal is to reduce demand in order to keep gas prices lower. So if the supply and demand of oil is going up, and you’re drilling more than the last administration, then how is this achieving your goal? And actually very little of what you just said is true. 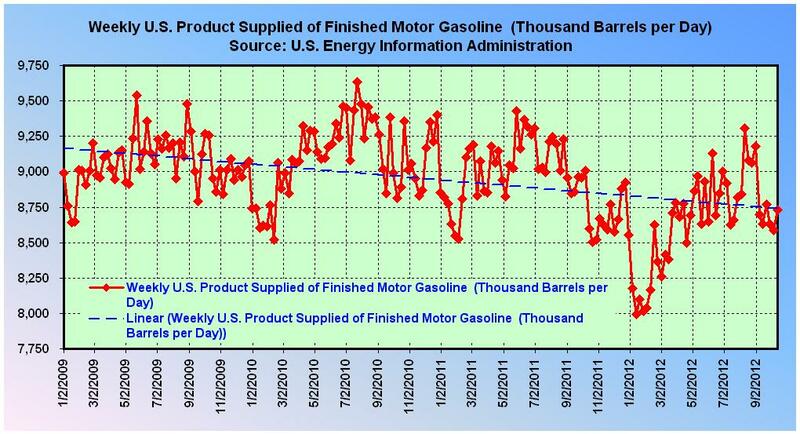 According to the U.S. Energy Information Administration production of finished motor gasoline is trending downward, not up (see chart above). Maybe this is why gasoline prices are hovering near historic highs? After all, we’re not talking about jet fuel and diesel, are we? And natural gas isn’t just appearing magically. We’re encouraging it and working with the industry. Can I fill up my car with natural gas tomorrow morning? Because if I could, that would truly be magical. And when I hear Governor Romney say he’s a big coal guy, I mean, keep in mind, when — Governor, when you were governor of Massachusetts, you stood in front of a coal plant and pointed at it and said, “This plant kills,” and took great pride in shutting it down. And now suddenly you’re a big champion of coal. 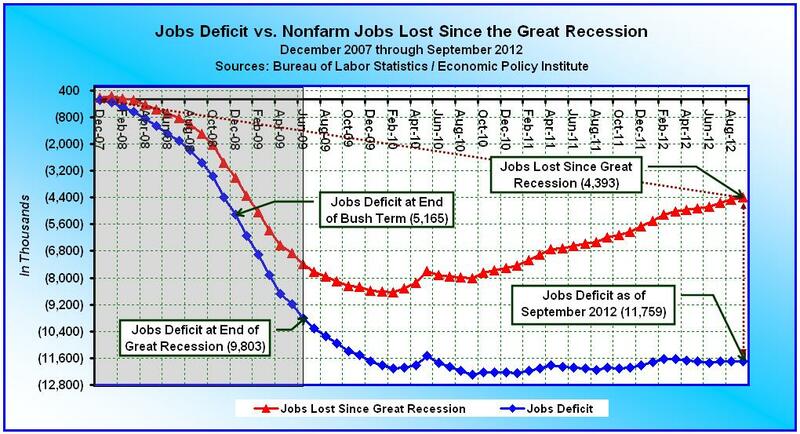 Maybe Romney’s a big champion of jobs, unlike you Mr. President. 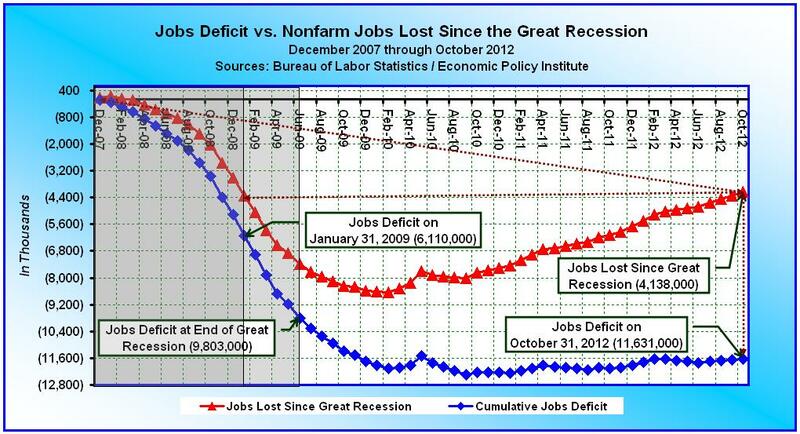 At least he’s got a plan to create 12 million jobs in four years to eliminate the current jobs deficit. Where’s yours? So what I’ve tried to do is be consistent. With respect to something like coal, we made the largest investment in clean coal technology, to make sure that even as we’re producing more coal, we’re producing it cleaner and smarter. Same thing with oil, same thing with natural gas. Yeah, consistently wrong. The question wasn’t about coal, clean coal or natural gas, you we’re specifically asked to comment on the Energy Departments role in keeping gasoline prices affordable. And the proof is our oil imports are down to the lowest levels in 20 years. Oil production is up, natural gas production is up, and, most importantly, we’re also starting to build cars that are more efficient. So now you’re saying that oil imports are down to the lowest levels in 20 years. A minute ago you said 16 years. Let’s see, so that would be 1992, right? In 1992 the price of regular unleaded gasoline averaged $1.13 per gallon, which would be equivalent to $1.86 today. So if oil production is up, oil imports are down, and they’re building more efficient cars, then why am I still paying close to $4.00 a gallon at the pump? And that’s creating jobs. That means those cars can be exported, ’cause that’s the demand around the world, and it also means that it’ll save money in your pocketbook. So by producing more efficient cars, America will someday be able to export them to Libya, Egypt, Iraq, Iran, Greece, Spain and such, and this will create jobs and save money in my pocketbook. 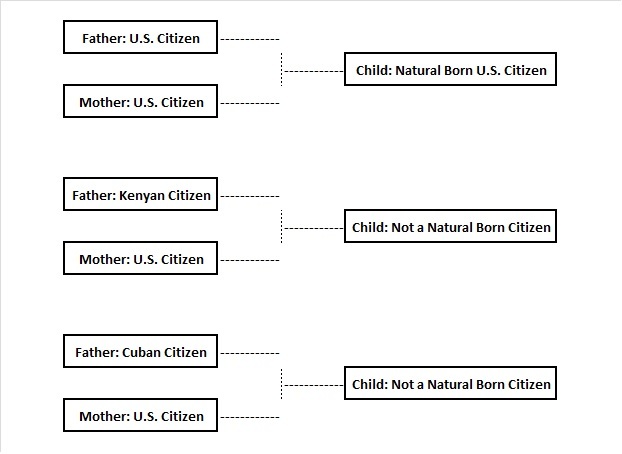 Well, that’s interesting, albeit illogical. Obama’s List Of Failed Green Energy Jobs & Companies. Secondly, as far as saving money in my pocketbook, what’s a pocketbook? It seems that you’re either talking about something way off in the distant future, or the archaic past, but the question pertains to right now, today, within my lifetime. No Mr. President, that’s not the strategy I need. What I need is for gasoline prices to drop by at least half of where they are today. So do you agree with Secretary Chu that it’s not the job of the Energy Department to help lower gasoline prices or not? Will gasoline prices be half what they are today if you get reelected, or twice as high? 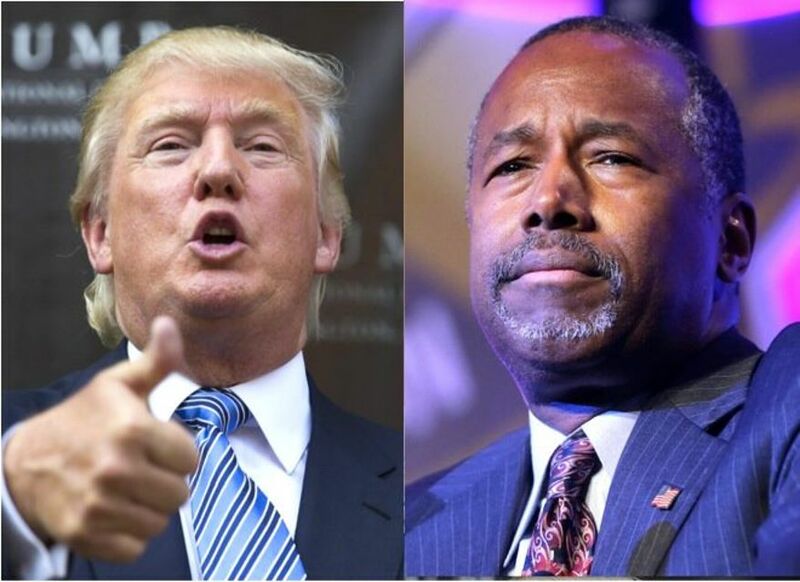 Oh never mind, I’m leaning heavily towards the other guy anyway. 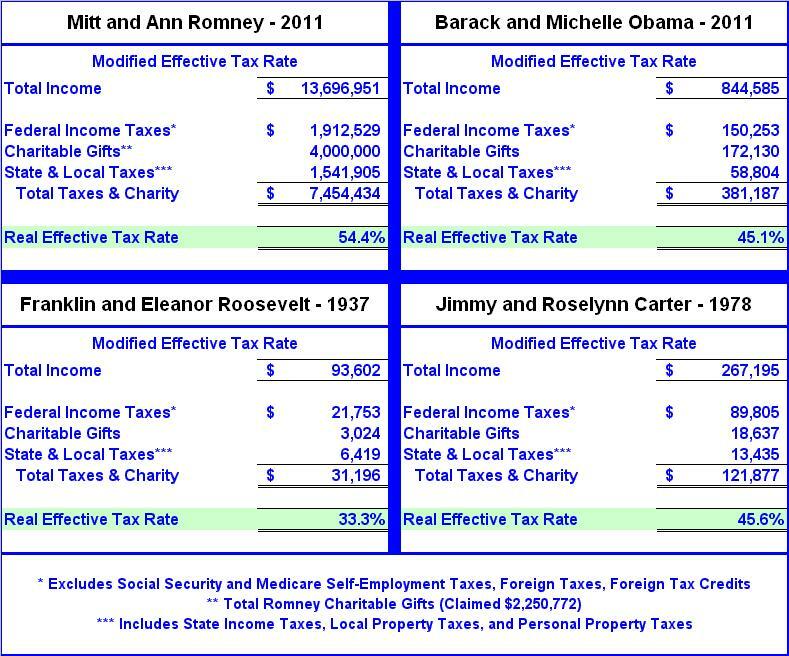 I can make sense out of Romney’s policies, but as for yours, the record speaks for itself. Obama’s List Of Failed Green Energy Jobs & Companies!! !